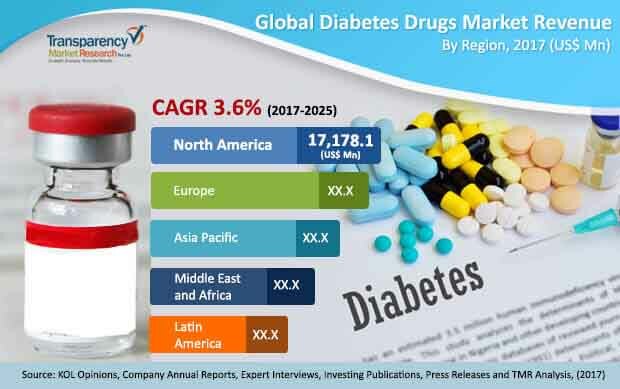 As per a report by Transparency Market Research (TMR), the global diabetes drugs market is predicted to clock a CAGR of 3.6% over the forecast period between 2017 and 2025. At this pace, the market’s valuation of US$43.1 bn in 2016 will become US$58.4 bn by the end of 2025. Geographically, the diabetes drugs market has been segmented into North America, Asia Pacific, Europe, Latin America, and the Middle East and Africa. North America, among them, held the leading share of the market in 2016 due to high prevalence of diabetes. Europe held the second-leading share of the market in 2016 due to an established research and development infrastructure for drug improvement. The Middle East & Africa is anticipated to emerge as a key market for diabetes drugs due to increasing prevalence of diabetes and rising disposable income in the region. Some of the top companies operating in the global diabetes drugs market are Novo Nordisk A/S, Boehringer Ingelheim GmbH, Novartis AG, Bayer AG, Merck & Co., and Sanofi. Some other prominent companies operating in this market are Takeda Pharmaceutical Company Limited, Johnson & Johnson, Boehringer Ingelheim GmbH, and Eli Lily and Company.